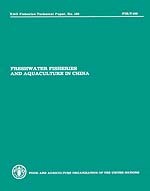 This document was prepared by the FAO Fisheries (Aquaculture) Mission to China which visited the People's Republic of China, 21 April to 12 May 1976, to study the aquacultural and fishery practices of the country and consider ways of utilizing the Chinese experience for the further development of inland fisheries and aquaculture in other member countries of FAO. Inland water environment. Water management. Inland fisheries. Freshwater fish. Aquaculture. Agropisciculture. Fish culture. Pearl culture. Aquaculture development. Production(biological). Fishery management. Stocking(organisms). Rearing. Disease control. Fishery products. Marketing. Education. Sociological aspects. Economics. China, People's Rep.